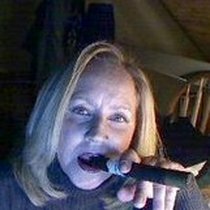 I am the host known as the "vaping nudist" so I must be Cigarbabe! I've been hosting shows for approximately two years or so combined. I have always been an early proponent of hybrid mods as well as genesis atty's and new technology. I started vaping 3 years ago after trying and failing to quit using all the recommended NRT's available at that time. I just happened to be talking to a someone on Skype who was using an early version of a bottom fed device and he casually mentioned he quit smoking via that device….I just had to have one! That night I ordered my first ego kit and three days later…something miraculous happened. I had accidentally quit smoking! This was a huge deal for me since I had been diagnosed with COPD and could barely walk my beloved dogs. Three weeks after getting that ego I went to a vape meet in CT. where I met Bruce from COV and purchased three mods and I have been hooked trying to get others to vape or at least try it since then! I moderate several groups on Facebook and google dedicated to vaping and mods as well as pushing to overturn the bans in my home state of MA. whenever I can. My shows are a mix of information about the latest devices, genesis atties, new vaper info and having a good time and making you laugh as much as possible! Prizes donated by Zenesis APV's, Vaping Watch.com , Ripple Effects eliquid ,Timeless Vapors, Mad Murdock Juices.